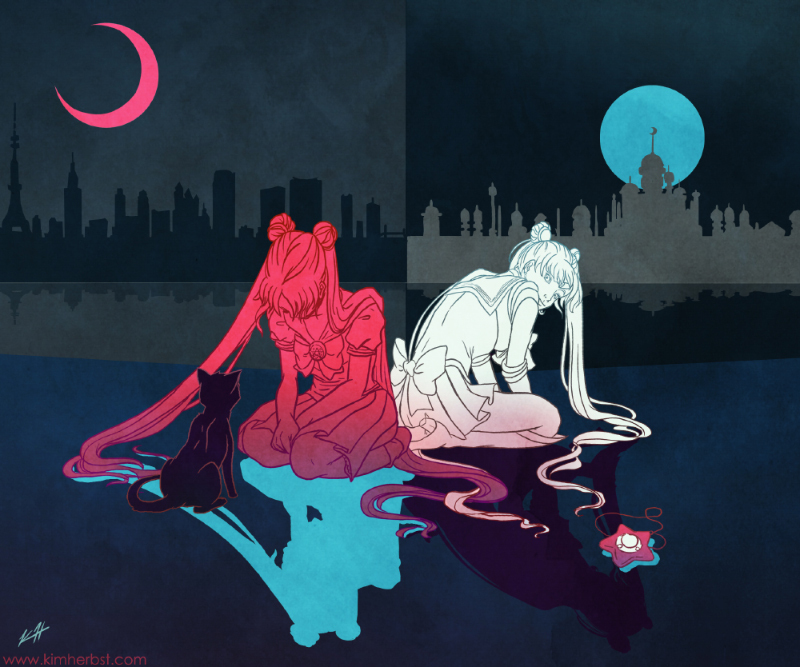 The ever-popular Sailor Moon is getting a reboot series this year - figured I'd do an illustration to celebrate. Also: warning of a fandom rave below. Truth be told, I first saw commercials for Sailor Moon's dolls when I was about 11 years old, so my interest was piqued from the tidbits of animation they showed. And then discovered it was on extremely early in the morning before going to elementary school. I became obsessed with it because it had that wonderful story-line that we the viewer (or reader, in some cases) can easily put ourselves in. Reminiscent of Spider-Man for guys, or for more broader, recent references to all: Harry Potter. It got dark, fast. There were certainly hilarious things about it that I can think are absol-freakin-lutely crazy like a masked man in a tuxedo/cape combo that spouted lines of random poetry whenever he arrived to the scene. But for the most part, it was about an average, everyday person, suddenly being thrown into something that no matter what, they had to deal with the situation that required insurmountable determination and bravery. They were given this great power and responsibility. It just screams coming of age/adolescence, and going forth into adulthood. But for me, as a kid, all I wanted was to get to age 14, which was how old Sailor Moon was, and just hope and pray that a weird cat with a crescent moon was going to hop through my window and change my life forever. I wanted the cool costumes, and the flashy transformation sequences, and the powerful abilities (that you had to shout aloud). I just didn't think about the realistic consequences. I mean, the thing about this girl was she wasn't incredible in any way. She failed tests, made awful tasting food, tripped over her own feet, cried when she scraped her knees, and didn't look where she was going so she ran into telephone poles, and so on. I mean, this was the savior of the world, she was given this immense responsibility. It shows at one point that she didn't even want it anymore but she turns around and steps up to the challenge to continue taking up the helm, because she has to do it. When I got past age 14, I started thinking that maybe, just maybe, I didn't want that cat to come through my window. Adolescence already has so many extras added on to make life so troublesome. ...As an adult, I still want that flashy transformation sequence and attack though. mmm it was so worth waking up at an ungodly hour. I think we all still secretly hope a talking cat will show up and inform us of a magical secret. Ive taken in three strays and they all failed me in that respect. Oh well.Lovely illustration! Happy (Early!) Year of the Snake!